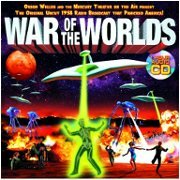 Album: "The War Of The Worlds"
Review: I'm sure you're probably all familiar with the original 1938 radio broadcast of "The War of the Worlds". After all, it's arguably the most famous radio broadcast of all time. But I'm going to guess a fair number of you guys have never actually listened to it, which is a damn shame. Because what you have here is a masterpiece in Halloween trickery, and possibly the largest Halloween prank ever pulled. It starts off as a nice and normal radio performance with Orson Welles reading from the original book by H.G. Welles. Then it switches to a news and weather report, and then to a musical performance by "Raymond Rockello and his Orchestra". Soon after they "interrupt" their broadcast with breaking news of strange happenings on Mars, followed later by the invasion and eventual destruction of the human race. Orson Welles and the rest of the "Mercury Theatre on the Air" pull the prank off beautifully, and really make it sound like an actual news broadcast. After the first disturbances on Mars, they reassure everyone how just how far away Mars is. When their reporter Carl Phillips is heading to the Grover's Mill crash site, they switch back to the music while they get everything setup. When the report gets cut off by the alien heat-ray, they apologize for being unable to continue the report from Grover's Mill due to "circumstances beyond our control". They later receive a bulletin that the "charred body of Carl Phillips has been identified". Yep, they kill their own reporter. Soon after they agree to turn over the radio station to the State Militia and we get to hear the military's futile attempts to destroy the Mars invaders, followed by reports of them all being wiped out by the aliens. This continues until we're down to a lone reporter on top of a broadcasting building reporting as he watches everyone in the area get killed by the aliens before finally getting killed off himself. Then... dead air. And finally, after they let everyone in on the joke and finish the performance, Orson Welles comes on and pretty much calls you a moron for believing it was real. "That grinning, glowing, globular invader in your living room is an inhabitant of the pumpkin patch. And if your doorbell rings and nobody's there, that was no Martian... it's Halloween." A fine performance indeed. In fact, they did such a fine job that there were news reports (real ones) of panic and mass hysteria. The FCC even got involved and made sure all future broadcasts told people that it was all make believe. It's a great listen, and a perfect addition to any Halloween collection. Actually there was no mass hysteria. It was just a ploy by newspapers to sell more papers by reporting that the news broadcast had indeed caused people to panic. Many of the photos featured in the pages of the newspapers were staged for dramatic effect as well. Still a good listen, though. I love that cover art. I haven't seen that one before. My grandfather had this in a classic radio broadcast collection [on cassette no less] that I listened to over and over as a child. He used to tell me how people were running from their homes at the time of broadcast because they believed it to be real. He even said a woman had tripped, then threw her shoes off saying she wasn't going to need them anymore. Nick: You are indeed correct that the news reports of hysteria were greatly exaggerated by the newspapers, fearing they would be wiped out by radio. However, in 1949 a Spanish version of the joke was played in Ecuador. The panic, and soon after riot of hundreds that followed caused at least six deaths, and they burned the radio station to the ground. He even said a woman had tripped, then threw her shoes off saying she wasn't going to need them anymore.